Fiona McConnell is Associate Professor in Human Geography and Tutorial Fellow at St Catherine's College. She joined the School of Geography and the Environment in December 2013. Prior to this she was a lecturer in human geography at Newcastle University and has also held a Junior Research fellowship at Trinity College, Cambridge (2011-2013) and an ESRC postdoctoral fellowship at Newcastle University (2010-2011). Fiona has a BA in Geography from the University of Cambridge (Fitzwilliam College) and PhD from Queen Mary, University of London. As a political geographer Fiona's research aims to develop new areas of thinking regarding governance beyond the state, how political legitimacy is articulated by marginalised communities, and changing practices of diplomacy and mediation. 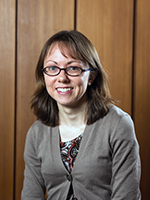 Fiona was awarded the Stanley D. Brunn Young Scholar Award by the Political Geography Specialty Group of the AAG in 2013 and held a British Academy Mid-Career Fellowship in 2017. She is an Associate Editor at Political Geography, and serves on the editorial boards of European Bulletin of Himalayan Research, Geopolitics, The Geographical Journal and Environment and Planning C: Politics and Space. Fiona also sits on the Board of Directors of the Tibet Justice Center, an independent volunteer committee of lawyers and scholars which advocates for human rights and self-determination for Tibetans. Driving much of Fiona's research has been an interest in how communities officially excluded from formal state politics are nevertheless engaging with aspects of statecraft, and in using such seemingly anomalous cases as a lens to critically examine the 'norms' of governance. Her doctoral and post-doctoral research focused on the political institutions and practices of the exile Tibetan government based in India, an institution which engages in state-like functions despite being legally unrecognised and lacking jurisdiction over territory. 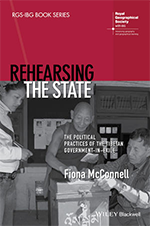 Fiona's monograph Rehearsing the state: the political practices of the Tibetan Government-in-Exile (Wiley 2016) draws on this research on exile Tibetan politics to consider the rehearsal of statecraft. Fiona has an ongoing interest in how political legitimacy is claimed, constructed and contested, particularly in the so-called margins of geopolitics, and in practices of peace, diplomacy and mediation. Fiona is interested in changing geographies and practices of diplomacy, with a particular focus on the diplomatic role of non-state actors. She has undertaken research on the diplomatic practices of the Unrepresented Nations and Peoples Organization (UNPO), a membership organisation of political communities not adequately represented at major international fora. This research has been funded by an RGS-IBG Small Research Grant, a John Fell Fund small award and a British Academy Mid-Career Fellowship . As part of this fellowship, and with additional funding from the Ray Y Gildea Jr Award (RGS-IBG) Fiona is producing Model UNPO teaching materials. From July 2015 - September 2017 Fiona coordinated a programme of knowledge exchange activities titled 'Training of diplomats from unrepresented nations: capacity building for effective UN lobbying'. This programme was run in conjunction with the UNPO and the Tibet Justice Center and was funded by the University of Oxford's ESRC Impact Acceleration Account. The team has published a training pack on UN advocacy and a report on reprisals at the UN. She was also Co-Investigator with Jason Dittmer (UCL) on an AHRC funded research network on 'translating diplomatic cultures'. An edited volume from this network was published in 2016. Working with Nick Megoran (Newcastle) and Philippa Williams (QMUL), Fiona has been developing a research agenda around geographies of peace. Their focus is on contextualised and contingent practices of peace, and their work seeks to critically unpack the nature of everyday peaceful existence and ask who peace is for. Extending this work to issues of mediation, Fiona is PI on the ESRC GCRF funded project 'Gobi Framework for sustainable infrastructure development: scaling up praxis from Mongolia to Central Asia', working alongside Troy Sternberg and Ariell Ahearn at Oxford. The 30 month project is a collaboration with Independent Research Institute of Mongolia (IRIM) and the University of Central Asia that seeks to develop a framework for sustainable infrastructure development to promote inclusive and environmentally sensitive socio-economic development in the context of Chinese mega infrastructure initiatives in Mongolia, Kyrgyzstan and Tajikistan. This research focuses on the spaces and practices through which minority groups negotiate their relationship with the state and the ways in which marginality might be conceived as a site of political mobilisation. There are two strands to this research. First, against a background of jobless growth in India Fiona has undertaken collaborative research with Al James (Newcastle), Bhaskar Vira (Cambridge) and Philippa Williams (QMUL) which examines the extent to which India's new service economy is 'socially inclusive' for graduates from marginalised communities. Second, she co-edited a special issue of Contemporary South Asia with Vasudha Chhotray (UEA) on 'Certifications of citizenship: the history, politics and materiality of identity documents in South Asia'. Fiona runs a Final Honour School option course 'Geopolitics in the Margins' and convenes and teaches on the FHS course 'Space, Place and Society'. She also lectures on the MSc in Nature, Society and Environmental Governance course. At St Catherine's College, Fiona and her colleagues are responsible for teaching students across the entire breadth of geographical topics for the Preliminary Examination and Final Honour School of Geography. Fiona welcomes enquiries from individuals wishing to undertake doctoral or post-doctoral research in the following broadly defined areas: contested sovereignties; practices and pedagogies of diplomacy; peace and non-violence; the Tibetan diaspora; marginality and liminality. 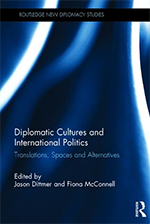 Dittmer, J. and McConnell, F. (2016) Diplomatic Cultures and International Politics: Translations, Spaces and Alternatives. Routledge, Abingdon. pp. 202. ISBN: 9781138845695. McConnell, F. (2016) Rehearsing the State: The Political Practices of the Tibetan Government-in-Exile. Wiley. pp. 240. ISBN: 978-1-118-66128-4. McConnell, F., Megoran, N. and Williams, P. (eds.) 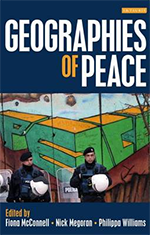 (2014) The Geographies of Peace. I.B. Tauris, London. pp. 288. ISBN: 9781780761435. Ho, E. and McConnell, F. (forthcoming) Conceptualising ‘diaspora diplomacy’: Territory and populations betwixt the domestic and foreign. Progress in Human Geography. McConnell, F. (forthcoming) Performing Diplomatic Decorum: repertoires of “appropriate” behaviour in the margins of international diplomacy. International Political Sociology. Chhotray, V. and McConnell, F. (2018) Certifications of Citizenship: the history, politics and materiality of identity documents in South Asian states and diasporas. Contemporary South Asia, 26: 2111-2126. McConnell, F. and Dittmer, J. (2018) Liminality and the Diplomacy of the British Overseas Territories: An Assemblage Approach. Environment and Planning D: Society and Space, 36(1): 139-158. Featherstone, D., Jones, R., Davies, A. and McConnell, F. (2017) Rehearsing the state: the political practices of the Tibetan Government-in-Exile. Social and Cultural Geography. McConnell, F. (2017) Liminal geopolitics: the subjectivity and spatiality of diplomacy at the margins. Transactions of the Institute of British Geographers, 42(1): 139-152. McConnell, F., Kuus, M., Jeffrey, A., Crawley, A., Vaughan-Williams, N. and Smith, A. (2017) Interventions on Europe's political futures. Political Geography: 1-11. Sternberg, T., Ahearn, A. and McConnell, F. (2017) Central Asian ‘Characteristics’ on China’s New Silk Road: The Role of Landscape and the Politics of Infrastructure. Land, 6(55): 1-16. (This article belongs to the Special Issue 'Arid Land Systems: Sciences and Societies'). Williams, P., James, A., McConnell, F. and Vira, B. (2017) Working at the margins? Muslim middle class professionals in India and the limits of ‘labour agency’. Environment and Planning A, 49(6): 1266-1285. Constantinou, C., Cornago, N. and McConnell, F. (2016) Transprofessional Diplomacy. Brill Research Perspectives in Diplomacy and Foreign Policy, 1(4): 1-66. Jeffrey, A., McConnell, F. and Wilson, A. (2015) Understanding legitimacy: Perspectives from anomalous geopolitical spaces. Geoforum, 66: 177-183. Wilson, A. and McConnell, F. (2015) Constructing legitimacy without legality in long term exile: Comparing Western Sahara and Tibet. Geoforum, 66: 203-214. McConnell, F. (2013) Citizens and refugees: constructing and negotiating Tibetan political and legal identities in exile. Annals of the Association of American Geographers, 103(4): 967-983. McConnell, F. (2013) The geopolitics of Buddhist reincarnation: contested futures of Tibetan leadership. Area, 45(2): 162-169. Williams, A., Jeffrey, A., Megoran, N., McConnell, F., Askins, K., Gill, N., Nash, C., Pande, R. and Townsend, J. (2013) Interventions in teaching political geography in the UK: practical and political considerations. Political Geography, 34: 24-34. McConnell, F. (2012) Governmentality to practice the state? constructing a Tibetan population in exile. Environment and Planning D: Society and Space, 30(1): 78-79. McConnell, F., Moreau, T. and Dittmer, J. (2012) Mimicking state diplomacy: the legitimizing strategies of unofficial diplomacies. Geoforum, 43(4): 804-814. Springer, S., Chi, H., Crampton, J., McConnell, F., Cupples, J., Warf, B. and Attewell, W. (2012) Interventions on the ruptures and transgressions of WikiLeaks. Geopolitics, 17(3): 681-711. McConnell, F. (2011) A State within a State? Legal and Welfare Relations between India and the Tibetan Community and Government-in-Exile. Contemporary South Asia, 19(3): 297-313. Williams, P. and McConnell, F. (2011) Critical Geographies of Peace. Antipode, 43(4): 927-931. McConnell, F. (2010) The fallacy and the promise of the territorial trap: sovereign articulations of geopolitical anomalies. Geopolitics, 15(4): 762-768. McConnell, F. (2009) De facto, displaced, tacit: the sovereign articulations of the Tibetan government-in-exile. Political Geography, 28(6): 343-352. McConnell, F. (2009) Democracy-in-exile: the 'uniqueness' and limitations of exile Tibetan democracy. Sociological Bulletin, 58(1): 115-144. McConnell, F. (2009) Governments-in-exile: statehood, statelessness and the reconfiguration of territory and sovereignty. Geography Compass, 3(5): 1902-1919. McConnell, F. (forthcoming) Dalai Lama. In, Martel, G. (ed.) The Encyclopedia of Diplomacy. Wiley-Blackwell, Oxford. ISBN: 978-1-118-88791-2. Megoran, N., McConnell, F. and Williams, P. (forthcoming) Geography. In, Richmond, O., Pogodda, S. and Ramovic, J. (eds.) Dimensions of Peace: Disciplinary and regional approaches. Palgrave Macmillan, London. Dittmer, J. and McConnell, F. (2016) Diplomatic Culture. Chapter 8 in, Constantinou, C., Kerr, P. and Sharp, P. (eds.) SAGE Handbook of Diplomacy. SAGE, London. 722 pp. ISBN: 9781446298565. McConnell, F. (2015) Reconfiguring diaspora identities and homeland connections: The Tibetan 'Lhakar' Movement. In, Mavroudi, L. and Christou, A. (eds.) Dismantling diasporas: rethinking the geographies of diasporic identity, connection and development. Ashgate. pp. 99-111. ISBN: 978-1-4724-3034-2. McConnell, F. (2014) Contextualising and contesting peace: geographies of Tibetan satyagraha. In, McConnell, F., Megoran, N. and Williams, P. (eds.) The Geographies of Peace. I.B. Tauris, London. pp. 131-150. ISBN: 9781780761435. McConnell, F. (2014) Negotiating activist/ academic roles in researching exile politics. In, Hammett, D., Twyman, C. and Graham, M. (eds.) Research and Fieldwork in Development. Routledge, London. pp. 24-25. ISBN: 9780415829571. Megoran, N., Williams, P. and McConnell, F. (2014) Geographies of peace, geographies for peace. Chap. 13 in, McConnell, F., Megoran, N. and Williams, P. (eds.) The Geographies of Peace. I.B. Tauris, London. pp. 250-260. ISBN: 9781780761435. Williams, P., Megoran, N. and McConnell, F. (2014) Introduction: geographical approaches to peace. 1. in, Williams, P., Megoran, N. and McConnell, F. (eds.) Geographies of Peace. I.B. Taurus. pp. 1-27. ISBN: 9781780761435. McConnell, F. (2013) Democracy-in-exile: the 'uniqueness' and limitations of democratic procedures in a territory-less polity. In, Arora, V. and Jayaram, N. (eds.) Roots and Routes of Democracy in the Himalayas. Routledge, New Delhi. McConnell, F. (2013) Nationalising a diaspora: The Tibetan government-in-exile in India. Chapter 17 in, Chatterji, J. and Washbrook, D. (eds.) Handbook of the South Asian Diaspora. London: Routledge. ISBN: 978-0-415-48010-9..
McConnell, F. (2013) Sovereignty. In, Dodds, K., Kuus, M. and Sharp, J. (eds.) The Ashgate Research Companion to Critical Geopolitics. Ashgate, London. Liddell, I., McConnell, F. and Nodari, T. (2017) Unrepresented Diplomats Project: UN Advocacy Training Pack..
Dittmer, J., McConnell, F. and Moreau, T. (2015) ‘Counterfeit Diplomacies’. The New Inquiry. McConnell, F. (2015) Book review: The Persistence of Nationalism: From Imagined Communities to Urban Encounters. Angharad Closs Stephens 2013 Routledge. Cultural Geographies, 22(3): 550-551. McConnell, F., Dittmer, J. and Moreau, T. (2015) 'Mimicking States: what non-state diplomats can tell us about the status quo’. Diplomat Magazine, 1(8): 10-12. McConnell, F. (2014) Review of 'Arrested Histories: Tibet, the CIA and Memories of a Forgotten War' Carole McGranhan 2010 Duke University Press. American Ethnologist,, 41(4): 207-209. McConnell, F. (2011) Borders and Borderlands: Windows on Statecraft. Political Geography, 30(2): 111-114. McConnell, F. (2011) Review of Higate, P. and Henry, M. 2009: Insecure Spaces: Peacekeeping, Power and Performance in Haiti, Kosovo and Liberia. London: Zed Books. Progress in Development Studies, 11: 170-172.